It’s now mid-May and many New Year’s Resolutions are out of the window. For me, I’ve used the end of the year as an overview for achievements and looked at my goals for the New Year and the next year’s ahead. Rather than a mainly short-term change, I’m nowadays focusing on far reaching and long-term changes helping me to live the life I’m dreaming of. When determining your goals, you automatically look at your dreams. But what do you want? Have you sat down and thought about your vision for your future? Defining your vision and setting goals gives you a long-term view as well as short-term motivation and actions. It’s been proven that writing goals down will increase your achievements, yet, only 3% currently have their goals documented in writing. “Oh, I’ll need to make this one call.” or “Let me just wash the dishes and I’ll start.” These were some of my excuses when it came to writing this post. For some reason or another, I didn’t seem to find the right start and postponed and postponed and postponed writing. Help! My guests are coming! Spring time is always the start of the new travel season. You can still go to places in the South without having to suffer from roaring temperatures and peak season fares. And so I’ve decided to fly my mom over. In Dubai, it’s now just over 40 C (104 F) and Emirates offered a great promotional deal. How could I not do it?! The Home Office – Are you still cleaning or already getting things done? Today was a great day. Starting with a walk around the lake, I’ve attended a very informative seminar about medical benefits in the GCC. The best was finishing my work day from home. To me, working from home has many advantages: Less interruptions and less distractions, a lot more focus and productivity! Given my various deadlines (who doesn’t have them), it was just what was needed and I was so pleased to close a number of activities off. To some, working from home is a very different story. The laundry basket is calling your name, you haven’t seen your neighbour for a while, why not catch up and oh, you haven’t decided what to cook for dinner yet. What can you do to treat your home office just like your regular office? Arriving sleep deprived to a brunch in Dubai is never a good thing. Learning at the entrance that our table is booked outside on the terrace was quite the surprise. The biggest realisation and shock though was that summer is approaching. Fast! For us in the Middle East, we’ll also observe Ramadan which is expected to be from 18 June until 17 July. This and the heat will impact our activities and it’s time to organise your social and outdoor activities. Get ahead of the game and get your calendar out. What do you want to do before it gets too hot and Ramadan starts? 168 hours! That’s how much time each of us have per week. The majority of these 168 hours will be spent in bed, hopefully being sound asleep. The second biggest chunk is being taken up by our work. Being in the Middle East, we often face working outside of our normal working hours. Who doesn’t work with colleagues in Western countries which are 2, 3 or even 8 hours behind our time zone and which have the Monday – Friday working week instead of our Sunday – Thursday working week? Living in the Middle East, where temperatures can easily reach 45-50C (113-122F) in the summer, the thought of a siesta or afternoon nap to recharge your battery is very appealing. This morning, my colleague Marie was telling me this morning how low her energy levels were. Bang! At 2 am, she was bright awake and couldn’t fall back asleep. I’m sure Marie would have preferred the option for a power nap after lunch. I can so emphasise with the siesta idea as I’m coming across various energy vampires during my day. This is referring to individuals who are sucking the life out of you. For me, multi-tasking is probably the biggest and more stressful one. Answering a call and simultaneously checking my emails or calculating something in excel don’t work. Every day, there’s a new study released which confirms that multitasking is not leading to increased productivity! What a great event the NAPO 2015 Annual Conference in Los Angeles was! Over the last 3 days, more than 500 attendees from the USA, Canada, Mexico, Japan, Finland, the Netherlands, Nigeria and Dubai (that’s me!) soaked up the latest trends in the organisation world, exchanged tips and tricks and formed a powerful network. I’m so proud to have become part of this mighty group! Did you know that the average US American household contains about 300,000 items (the average European only has 10,000 items)? According to Joshua and Ryan from The Minimalists, the 3 most dangerous words in the English language are “Just in Case”. You keep stuff for this “just in case” but when will this “case” ever happen? Have you ever thought of taking the Lean Principles from your office and apply them to your home, too? Remember Julia Childs, the famous chef, drew the outline of each pot and frying pan on a peg board. She and anyone else who worked in her kitchen would easily know where everything belonged. Do you account for all hours in your workday? If you’re unable to identify 2 hours per day and are charging $50 per hour, this costs you $26,000 in income per year! 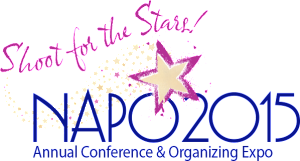 I’m really excited to be attending my first Annual Conference and Organizing Conference hosted by NAPO. Held in sunny LA from 15-18 April 2015, over 80 speakers like Julie Morgenstern, Clare Kumar and Barbara Hemphill will presenting the latest trends and developments. I can’t wait to hear and learn more about cool topics such as increasing productivity, virtual organising, maximising social media and running your business. If you are in the vicinity, contact me to arrange for a meeting. I’d love to meet you!